The Fun Parts by Sam Lipsyte: For the last decade, Sam Lipsyte has very slyly become one of the leading deep-sea explorers of our contemporary American society. I won’t be giving much away if I tell you that what he has so far surfaced to report back to us hasn’t been very pretty. The Fun Parts, book five in Mr. Lipsyte’s opus, which includes The Ask and Home Land, continues the troubling dispatches from beneath. This collection of stories, several originally appearing in The New Yorker, are as subversive, absurd, and hilarious as his earlier work. Witness, for instance, how our fellow citizens wrestle with their weight, their families, their jobs as, say, a (male) doula. “Classic American story,” Mr. Lipsyte begins one story, “I was out of money and people I could ask for money.” You know this won’t end well, but you’ll enjoy getting there. Mr. Lipsyte has mastered the art of fusing, within one sentence, pathos and hilarity. The effect on the reader is generally a guilty ghoulish humor — that is if they’re able to avoid looking in the mirror. In “The Republic of Empathy,” a tale about a man being hounded to have a second child, Mr. Lipsyte writes, “That night, I dreamed I had another son, a bigger one, and he punched me in the neck and I stumbled off the edge of a skyscraper. I fell through the air. I could also feel myself climbing out of the dream.” This might be as good a way as any to sum up our American century thus far. Saïd Sayrafiezadeh is the author, most recently, of the short story collection, Brief Encounters with the Enemy, and the critically acclaimed memoir When Skateboards Will Be Free. His stories and personal essays have appeared in The New Yorker, The Paris Review, Granta, McSweeney’s, The New York Times, and The Best American Nonrequired Reading. He is the recipient of a Whiting Writers’ Award and a fiction fellowship from the Cullman Center for Scholars and Writers. He lives in New York City and teaches creative writing at New York University where he won a 2013 Outstanding Teaching Award. Baba Booey to you, Said. So much of that book reminds me that the brightness of a welcoming new year is brief, that there is certainly a darkness that we’ll have to survive again. Brooklyn’s Doug Diesenhaus shares his favorite read of the year. Mr. Wilson’s Cabinet Of Wonder by Lawrence Weschler – In reading Mr. Wilson’s Cabinet of Wonder, I had an experience similar to the author’s sense of dislocation in observing his seductive subject, the Museum of Jurassic Technology in Los Angeles. He writes, “the visitor to the Museum of Jurassic Technology continually finds himself shimmering between wondering at (the marvels of nature) and wondering whether (any of this could possibly be true).” You’ll speed through this book and be so fascinated with Weschler’s incredible writing on how we look at art, facts, and history that you’ll have to check out two other great Weschler pieces: Boggs: A Comedy of Values and his recent magazine prototype Omnivore.Everybody is always recommending Weschler. I’ll have to add him to my list. Two anthologies intrigued me enough this year to use them in the classroom, a rare occurrence. New American Stories boasts a lineup of writers I appreciate — Rebecca Lee, George Saunders, Lydia Davis, Joy Williams, Don DeLillo, Robert Coover, Denis Johnson, and Claire Vaye Watkins — but its was the introduction by Ben Marcus that sold me on the book. I had written an essay on prefaces, introductions, and forewords this year for The Millions, so I’ve been particularly attuned to the existence of these literary first-acts. I am somehow becoming less cynical with age, so I don’t mind moments of literary cheerleading — as long as the origin appears genuine. Marcus seems to love words, and what more could you ask of an anthology editor? I have been reading stories for forty-two years and I still find it astonishing that, by staring at skeletal marks on paper or a screen, we can invite such cyclones of feeling into our bodies. It is a kind of miracle. Our skin is never pierced and yet stories break the barrier and infect us regardless. Love. The company of others. Shelter. There are some things that we need so innately that it feels awkward and difficult to explain why. To this list of crucial things, without we might perish, I would add stories. A short story works to remind us that if we are not sometimes baffled and amazed and undone by the world around us, rendered speechless and stunned, perhaps we are not paying close enough attention. Marcus might also champion poetry in much the same words, and his introduction could suffice for the 2014 edition of The Best American Poetry, although guest editor Terrance Hayes’s own introduction is excellent. One of my least favorite annual complaints is the requisite lampooning of the Best American Series by Writers Who Were Not Included, and while I don’t begrudge anyone their rants, it is best to encounter each anthology on its own merits. Hayes’s introduction is a hilarious imagined dialogue with a poetry scholar that includes a few simple but sharp teaching suggestions (“In my classes I ask students to name a poem’s hot spots. The idea is that in any poem there is a line or two that heats the rest of the poem. 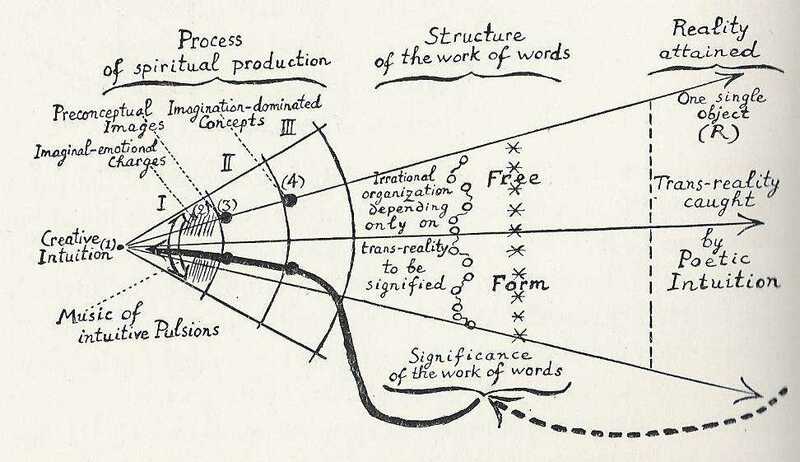 A kind of focal point that both anchors and charges it.”) and a wonderful diagram by Jacques Maritain from the chapter “The Internalization of Music” in Creative Intuition in Art and Poetry. Perhaps my lack of interest in criticizing these anthologies is that I never view them as truly the best of anything, regardless of their intentions. I view an anthology as a sequence of previews: most are well-produced, some are thin, some are out of place. A good anthology will feel like it carries a narrative arc, and has much the same feeling as completing a good collection of short stories. A great anthology will happily and humbly exist in the service of its writers, and will appreciate when readers put the collection down and seek more and more of the words that truly stir them. I’m thankful for such an experience twice in a single year.